This article focuses on tonight’s six-game NHL main slate, highlights a few DFS players that stand out, and a few potential wagers against the spread. Feel free to jump in our new sports betting Slack channel for additional information and updates when it comes to tonight’s action. Make sure to stay tuned for additional announcements as we continue to add articles, videos, and additional tools centered around our sports betting content. Make sure to follow our @AwesemoOdds twitter account for the latest. Toronto at Montreal, 7 PM EST – Montreal is one of the better teams in the league at 31-18-6 while Toronto remains one of the best road teams in the league at 16-6-2. Toronto comes in with a +0.83 goal per game differential away from home while Montreal brings a +0.33 goal per game differential. This is partly why the line only opened at Toronto -120, as the oddsmakers have given Toronto a slight nod in this spot on the road. The first thing to note is that both teams are 4-0-1 in their last five games. That includes both winning three straight and averaging over three goals a game. If the value rises above +110 or higher for Montreal, that would be a good number to bet. Since November 27th, Carey Price has been on fire. In the 30 games that Shea Weber has played, Price’s goals against and save percentage have been among the top-3 in the entire league. The only concern is the power play which has been under 11% and the penalty kill which has been just under 78% in that span. Frederik Andersen versus Price presents itself as quite the matchup if it occurs. Please note that Andrew Shaw and Paul Byron are still out for Montreal. Toronto is missing Tyler Ennis, which basically means they are at full health. This game comes down to the top lines and special teams. It is why some may risk a tiny portion of their bankroll and place it with Montreal at +105. Also, keep an eye on the over/under. Does it stay at 6 1/2? It appears as it should. It may be worth it to take the under at -115. Jonathan Drouin – Montreal Canadiens – $4900 DK – There are plenty of games to attack tonight and this is one of them. Toronto allows nearly three goals a game (3.2 over the last 12 road contests). Drouin scored four points in his last game and 14 points overall in his last ten. He averages 2.9 shots on goal a game currently and fired a season-high nine shots on net on Thursday. Overall on the season, the Montreal winger now has three goals and 14 power play points. Though Toronto’s penalty kill is nearly 82% on the road, the last two seasons have seen Montreal play well at home against Toronto. The winger is a big reason why Montreal has been so good this season. 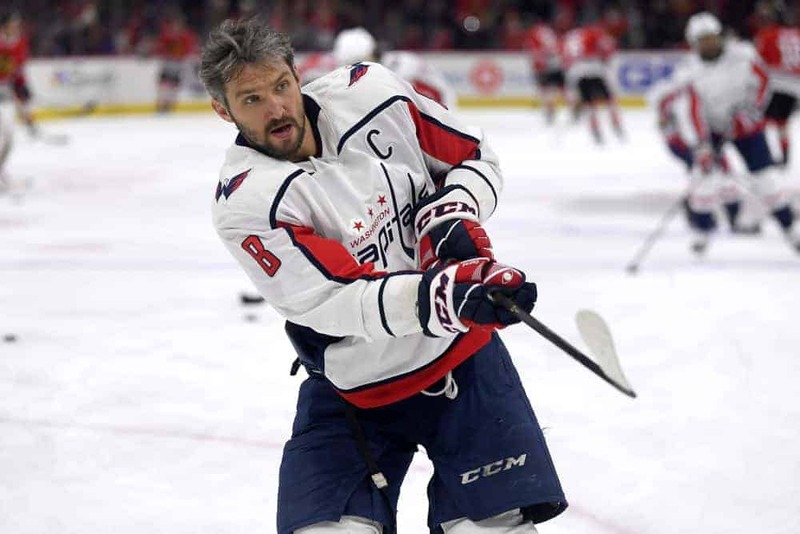 Alex Ovechkin – Washington – $7300 DK – Ovechkin has cooled a bit with 35 shots in his last ten contests on 62 attempted. The left winger scored five times in that span with two power-play goals. The price is a solid play given Florida yields a slate worst 3.81 goals per game on the road. Ovechkin should fire 4+ shots tonight and have a few chances on the man advantage as well. The chances Washington’s top line finds the back of the net is high. Also, Ovechkin scored 36 goals in 61 previous meetings against Florida. San Jose vs Edmonton, Over 6.5 – Edmonton remains a defensive enigma while San Jose may be without Erik Karlsson again. San Jose could easily score three goals but could allow three or more just as quickly. Martin Jones appears likely in net for the Sharks which can be an adventure. However, he won four straight starts with three quality starts. As for the Oilers, they allowed 19 goals in their last five games. San Jose allows almost 35 shots a game without Karlsson in the lineup. This game could definitely be wide open much like the San Jose-Calgary game was the other night. Washington (-160) vs Florida, Over 6.5 – Breaking down this game indicates a possible buy at -150 or even -155 for the moneyline. When a team is 29th defensively like Florida is going against a team like Washington who is in the bottom third defensively as well, the numbers set up nicely. The only risk is Florida who has seen the under hit in four straight games. This pick goes against the grain but Washington has won two consecutive contests. Furthermore, the Capitals historically score over 3.5 goals per game at home versus Florida. Pittsburgh Penguins +155 – This is a late entrant but only if the value stays around the current line. Tampa Bay comes in scoring just seven goals in their last five games and Pittsburgh only 13. This may even be a spot to try the under as well. Matt Murray expects to take on Andrei Vasilevskiy in this game. Both teams may play tight given they have lost multiple games in a row. Pittsburgh will not have Evgeni Malkin or Justin Schultz back yet so the number should stay pretty close to the current line. Take a look at Vegas -140 to score first. Columbus allowing a quick goal early with ease is likely. Vegas plays faster at home which does carry some risk. Their top line matches up well versus Columbus. The period prop (first period O/U 1.5) for the San Jose Sharks and Edmonton Oilers is high at -150. However, consider the teams have allowed 37 goals over the last five games combined, that is understandable. This over bet is one which features some appeal. On the other hand, the third period over/under of 2 is lower at -140. The Ovechkin one goal prop is at +140, which is a reasonable value. This is because Florida and Washington have hit the over in six of the last nine games in Washington. That could be a better bet on Saturday night.